Kitchen Garden | Our Farm by Earth Flora Inc. This is the 2nd of a series on Backyard Farming. This article will give you tips on a garden plan, what to grow, crop rotation and multiple cropping. What to plant? What you plant will depend on: (1) What you need; (2) Where you are; (3) The needs of the plant; and (4) How much time and patience you have. If you want easy vegetables, here’s an old article: Easy Vegetables to Grow in the Tropics. Remember that there are crops that you can plant in the lowlands, and crops that will only grow in lower temperature or in the highlands. We practice crop rotation in our farm and in our kitchen garden. This means you plant different kinds of vegetable in your garden bed every cropping season. Why? Crop rotation will prevent pests and diseases from building up in your soil. If you keep planing one kind of vegetable in the same bed every time, you will be attracting the pests and diseases that are common to that plant. These pests and diseases will then keep building up on your soil. However, if you rotate your crops, you will have a different set of vegetables that do not interest the pests/diseases from the last crop. 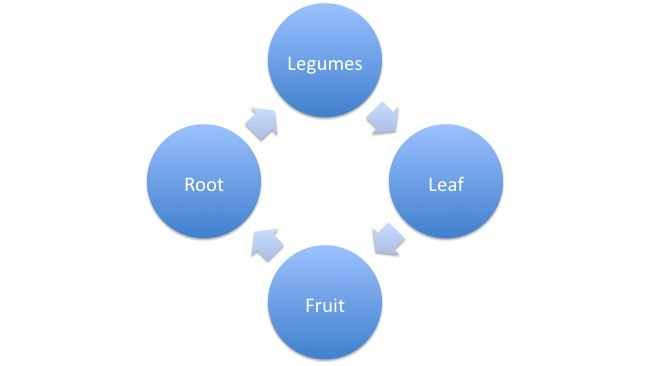 Another reason for crop rotation is that different crops have different demands on the soil. For example, salad greens, tomatoes or eggplants are heavy feeders. Carrots and root crops are light feeders. Planting legumes will add nitrogen to your soil. A crucial part of biodynamics is the need to allow nature to follow its own pace and not force growth or impede it. Do not try to force the soil to produce as much as it can just because it can. Thus, alternate the vegetables you plant to allow the soil some breathing space in between crops. Some tips: Follow Give and Take in succession. Cabbage plants are heavy feeders. They are TAKERS. Do not plant them on the same plot one after another. Fruit crops need plenty of compost but very little nitrogen. They are moderate takers. The roots of legumes also have other micro organisms that destroy pathological bacteria in the soil. Foliage crops need plenty of nitrogen and compost. They are TAKERS. Following biodynamic farming, you should be inter-cropping leafy vegetables with root vegetables and legumes. Plant the same veggies in the same bed in succession. Another practice we follow is multiple cropping. On the same bed, we plant vegetables that support each other. Some plants may house beneficial insects, which the other plant needs to control pest. They ward off each other’s bugs or thrive well together. You can also use companion planting to make better use of your soil or so you have windbreaks that protect sensitive crops. Marigolds emit a strong fragrance that confuses pests. You can plant marigolds all over your garden. They are pretty too! The strong aroma of herbs like dill, rosemary or thyme also repels pests and attracts predators (insects that eat pests) and pollinators. Next article: Growing your Garden: preparing your beds, mulching, sowing, nursery and transplanting. This is Article 1 of the Series on Backyard Farming. Before you start though, go easy on yourself. Leave your dread at the garden gate. We will try to make gardening easy for you. Enjoy getting dirty! The first thing you have to do is plan your garden. What this means is that you determine where you will be planting. What will be the layout, orientation and planting areas? Evaluate the area where you are planning to build a kitchen garden or backyard farm. Remember that gardens are ECOSYSTEMS! Where are you growing your vegetables? For example, what is the type of soil you have. How big is your area? 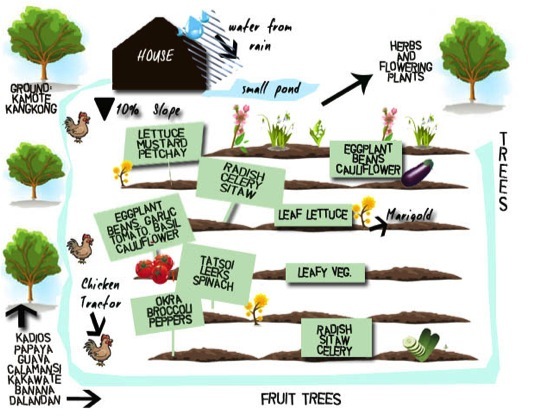 Plan out the space so your planting area is not too far from your compost pit or water source. Also identify if there is space for a small nursery. If your area is slightly sloping, make sure that it is not prone to flooding during the rainy season. A steep slope will wash top soil right away. If you have a low lying area where the rainwater collects, consider turning the lowest lying area into a small fishpond or reservoir for water. When you have to garden in a slope, it will be best to restructure the slope into terraces. SUN: Almost all vegetables and fruits will need at least 8-10 hours of sun every day to thrive. Pick a place that gets enough sun and make sure it is not too close to existing trees. Trees will place a shadow on your vegetable beds most of the time. WATER: Find a place that will allow you easy access to water. During the summer, you will have to water your plants more so you might want to have it closer to the tap or water source. SOIL: Good soil will be the most crucial. Where is your best top soil found? You will need to build the quality and structure of your soil with good compost and in our case, biodynamic preparations. One of the most important thing you will have to do is to build healthy living soil. PROTECTION: Make sure that it is protected from wind drafts and too much water. As we live in a tropical country, we often suffer from strong winds and heavy rain. These factors should always be considered when planning the garden. For example, if your area is prone to strong winds, it may be best to have windbreaks. These are structures that will slow down the wind like hedges, rows of ipil-ipil trees, bamboo fences, or a net. You can also have bamboo sticks as support for plants. More on windbreaks and protection from rainfall here. Find the area where the water runs if it rains and make sure your beds are not there. Once you have these questions answered, and have the essentials figured out, it is time to plan what vegetables to plant. Next article: What to Grow.